MOF-199 was synthesized in two ways: mechanochemical and microwave activation. 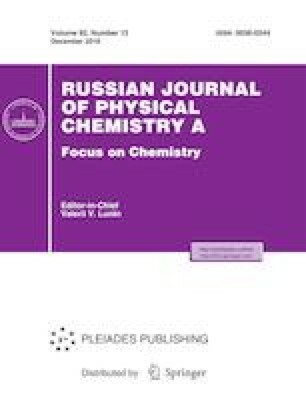 The synthesized materials were characterized by X-ray diffraction and the Klyachko–Gurvich technique of measuring their specific surface areas. Rotational spectra were modeled for compounds representing the most important ligands in the synthesis of MOF-199-like structures: 1,3,5-benzenetricarboxylic acid, 2-methylimidazole, terephthalic acid, and 2,5-dihydroxyterephthalic acid. Based on the resulting data, an explanation was proposed for the abnormal behavior of the 1,3,5-benzenetricarbolxylic acid–copper(II) acetate reaction mixture under conditions of microwave activation and the impossibility of synthesizing MOFs from terephthalic and 2,5-dihydroxyterephthalic acids without a solvent. An erratum to this article is available online at https://doi.org/10.1134/S0036024419140012. This work was supported by the Russian Science Foundation, grant no. 17-13-01526.